Earnings-related options ideas are among some of our favorite plays to track, and that’s what we’ve got here with AEO this morning. American Eagle had a mixed earnings release, satisfying on profit expectations while falling short of on both sales and outlook. 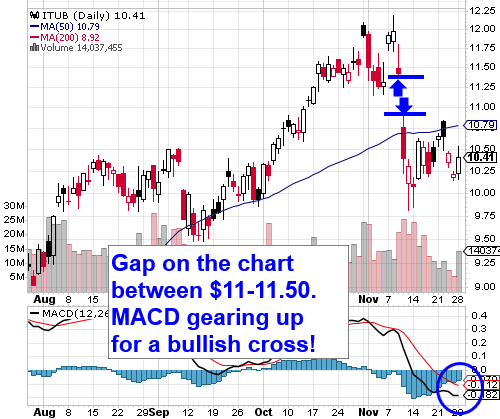 Granted that the stock was already looking a bit top-heavy, we’re feeling bearish about this play for the short-term. To coincide with that instinct, we’re going to signal our interest in a range of puts in the AEO options chain. For possible quick-strike trades, we’re going to be looking at the AEO Weekly $19.50-16.50 Puts. Splunk, Inc. SPLK – We’ve also got a bullish options idea to bring to the table with SPLK, and this one is earnings-related as well. The company posted a strong quarterly report yesterday and is surging as a result. In this case we’re going to highlight and track the SPLK Weekly $60.50-62 Calls. While we’ve mentioned Petrobras countless times in our reports in the form of PBR, this marks the first occasion upon which we’re focusing on its Argentinian counterpart. The stock has been getting absolutely hammered of late, and with an OPEC deal seemingly close at hand, oil has begun to run. That’s why we’re going to be tracking this one over an extended time period from this point forward. Should the production cut go off without a hitch, it sets PZE (as well as other oil stocks) up to regain a good bit of the ground lost in past weeks, so we’ll want to put this one on bottom-watch in the days and weeks ahead. After a relatively subdued half-day to close out the short week on Friday, we’re going to wipe the slate and start fresh today with a couple of options ideas. Based off of our initial scans and the premarket activity, we think each of these plays has the potential to help us start the week on a high note. AngloGold Ashanti Ltd. 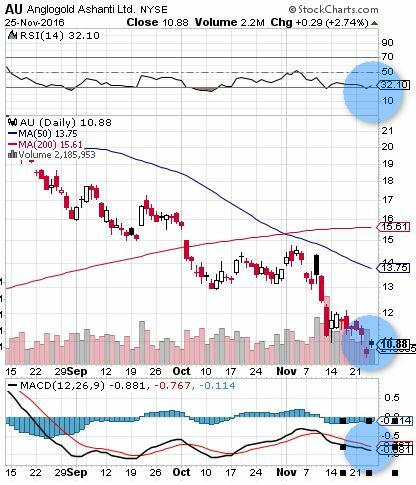 AU – For this one, we’re attracted to the positioning on the chart, where, as you can see below, the stock has just begun to rebound off of its lowest PPS in roughly 9 months. Add that to some bullish premarket activity, along with a number of ripening indicators, and we’re very interested in the possibilities. We’re going to be focusing in on the AU 1/20 $11 and $12 Calls, which gives us more than enough time to see the extended recovery we’re looking for. Cognizant Technology Solutions Corp. CTSH – Our interest was roused by CTSH in this morning’s routine scan, and it too is currently in a favorable position on the chart, coupled with an appreciable premarket gap-up which could lead to a strong session performance. For this one, we’re going to be looking at the CTSH Weekly $57-60 Calls. Here we have another prime bottom-play with LEXG, which has managed to put together a pretty good rebound off of 6-month lows over the past few sessions. Currently trading at a low multiple around .0025, we’re looking at a stock that ran from similar levels to over .02 back in August. Even a fraction of such a move from current PPS levels would equate to sizable gain opportunities, so we’ll be putting LEXG on watch in the days and weeks ahead. CollabRx, Inc. RNVA – This one belongs in the bottom-bouncer category as well. RNVA is coming off of its recently established 52-week low, and appears to be geared up for a continued comeback. We’re going to have this one on close watch as well. Before we close out this 3-and-a-half day week, we’d like to take this opportunity to say, we hope everyone enjoyed the Thanksgiving holiday! We’re thankful for having such a great audience of faithful readers! You folks are the reason we get out of bed each day to provide our best insights and ideas on stocks, funds, and options! Cheers to you and yours! We included OMHE as a part of our extended watchlist on Wednesday morning, and the stock followed that up with a respectable performance on the day, despite a very quiet session, as is to be expected just preceding a holiday. OMHE traded in a range from a low of .026 to a subsequent high of .038, which worked out to an intraday gain of 46% and it came on relatively heavy volume to the tune of nearly six times the monthly average. Our timing in mentioning this play for the first time ever on Wednesday, was as good as can be, as the stock surged to a new annual high on the day. For these reasons, we’ll be sure to leave this play on our radar in sessions to come. In an added note, Omni Health is actually a spinoff of a cannabis stock that we have mentioned in the past- MCIG. Speaking of cannabis plays, we’ve continued to track the sector on the heels of this month’s elections, as was our intent. On the whole, activity has been more subdued than expected due to a number of other hot-button areas that have enjoyed good performance, such as the shipping sector boom that we took advantage of a couple of weeks ago. As always, we’ll remind everyone to keep a general watch over any and all pot plays, as you see the level of opportunity that the sector continues to bring to the table. S&P 500 ETF (SPY) - We tagged the SPY 11/23 $218.50-220 Calls for observation on Monday, and wanted to circle back around to relay the excellent moves it went on to make. Keep in mind that trading these today would essentially be akin to trading normal weekly contracts on a Friday, a risky venture that we always warn is to be attempted only by advanced traders. and while they didn’t move quite as much as the SPY calls, the potential gains were still significant. Unlike the aforementioned play, these contracts don’t expire until the end of the Friday’s half session (1PM). The characteristic volatility that we’ve come to expect from CCTC showed it face this week, as the stock turned the bottom-bounce from the end of last week into a multi-day run that has persisted ever since. We’ll look for the possibility of a breach of the 200DMA currently sitting at .302, a break past which point would send the stock into blue skies, while keeping in mind that the volatility we mentioned could come into play. We’ll need to be open to the chance of the stock consolidating again before gearing up for another run. One thing’s for sure, the rapidity with which this play can cover large amounts of ground on the chart makes it worthy of continued observation.